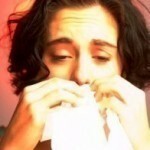 The most common disorder of the immune system is allergy. Allergy is a common reaction of the body to common allergens which are substances from the environment that can trigger the body’s hypersensitivity reaction resulting to various types of allergy symptoms. The body’s hypersensitive reaction against the common allergens such as dust, pollens, and dander are due to the excessive reaction of the white blood cell to produce an antibody resulting to inflammatory responses and other allergy symptoms and reactions. The signs of allergy symptoms usually vary on the degree of the body’s reaction to the allergen present that triggers the body’s hypersensitivity reaction. There are minor and major allergic reactions that are commonly manifested depending on the triggering factor. Common allergic reactions come from food allergies, hay fever, hives and asthma. Other sources of allergy symptoms are from insect bite, bites from bees, insect and venomous animals. Minor and early symptoms of allergy are one consisting of itchiness, watery eyes and nasal congestion. 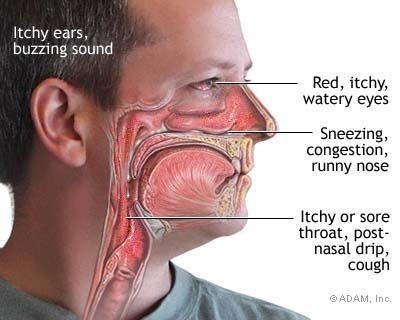 Oftentimes these minor allergy symptoms are localized and do not spread throughout the body. Major allergy symptoms may involve life threatening condition due to anaphylactic reaction of the body that may start from mild allergic symptoms that progress to spread throughout the body. Symptoms such as vomiting, cramping, abdominal pain, diarrhea, shortness of breath and difficulty in breathing and in some cases mental confusion occur. Allergy mostly affects the different organs of the body such as the nose, eyes, airways, sinuses, GI tract, skin and ears. Typical allergy symptoms present are nose irritation, bronchial constriction, coughing, sneezing, wheezing, itching and redness of eyes. The important part of making an accurate diagnosis for allergy involves the assessment of the allergy symptoms manifested by the patient. It also involves ruling out the presence of other conditions and identifying the particular allergen that triggers the allergic reactions. If food allergy is suspected the doctor will most likely determine which kind of food you are eating that gives you an allergy reaction. The food allergy symptoms usually occur after eating. The symptoms of swollen eyelids, itchiness, coughing, vomiting, breathing difficulty and diarrhea are mostly apparent. 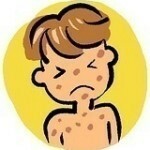 There are also diagnostic tests for allergy. One is allergy skin test which involves a procedure of determining the specific substance that causes the allergic reaction. Blood test is also carried out to diagnose allergies. Treating the symptoms of allergy is quite easy most especially when minor symptoms are always relieved with over the counter medications. Prevention is always the first line of defense from allergy symptoms or simply by avoiding the common culprits that trigger your allergy. The annoying allergy symptoms are always relieved by taking antihistamines and anti-allergy medications. One can also get an allergy shot to increase one’s tolerance against the common allergens. Decongestants are also adjunct treatment to relieve the minor and common allergy symptoms of nasal decongestion. Prescription drugs are often the treatment options for major symptoms of allergy. It is always best to explore the many treatment options for allergy symptoms and determine the one that works best for you.